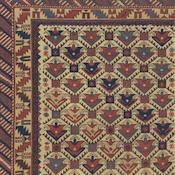 The Daghestan area marks the north-eastern border of the Caucasian rug making regions. 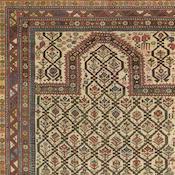 Covering breathtaking mountainous terrain, Daghestan translates ‘land of the mountains’ and boasts “some of the most beautiful and wild scenery of the whole Caucasian region. 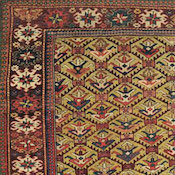 Its vast peaks, swift-flowing mountain rivers and long, bitter winters meant that the area remained isolated until the 1860s, when the Russians invaded”(Middleton, Michael, Rugs & Carpets: Techniques, Traditions & Designs. Mitchell Beazley, London, 1996, p. 59). 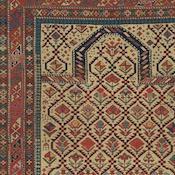 “Daghestan is famous for the production of ivory-ground prayer rugs…. 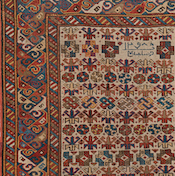 The field design…standard for this area [includes] a serrated lattice containing polychrome stylized plants beneath the mihrab… Minor design variations….can greatly enhance the value of a rug and ensure that such pieces will be keenly sought after by collectors. 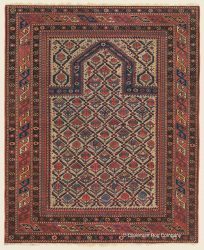 (ibid, p. 59)” For example, the ivory ground Daghestan prayer rug to the right offers many traditional Daghestan rug elements in addition to the innovative motifs valued by connoisseurs of antique Caucasian rugs. 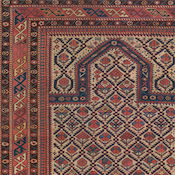 A singularly charming design and spacious, rhythmical placement of motifs in both field and border instantly distinguish this Daghestan antique carpet among collectors of antique Caucasian rugs. 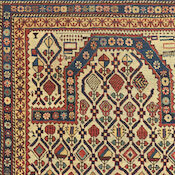 This superb tribal rug offers a standout narrow field and unique mihrab ornament further contribute to its rarity, reflecting advanced artistry. 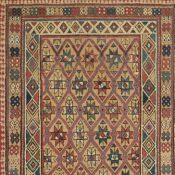 The expansive range of soft pastel dyes is remarkably wide and varied, including glowing highlights of golden saffron and rare apple green set against a creamy ivory backdrop. 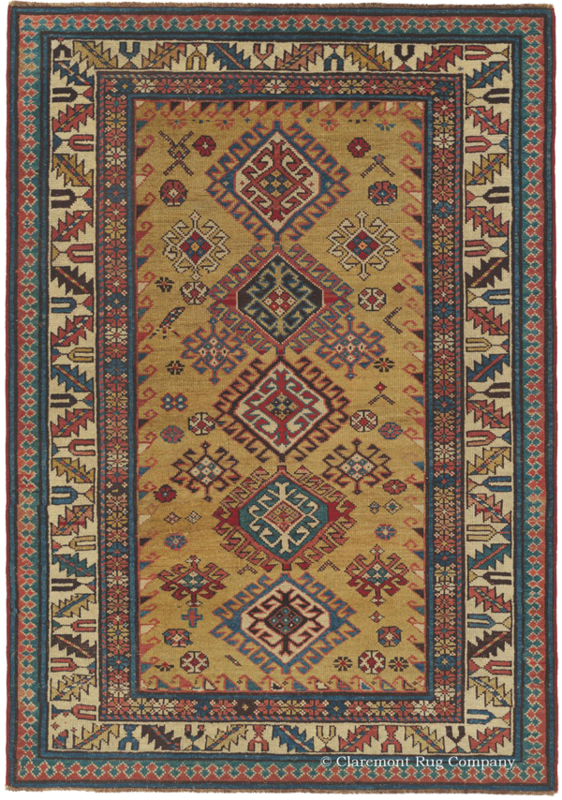 All in all, this is a completely memorable, 19th-century Oriental rug that would be equally stunning on the floor or wall.